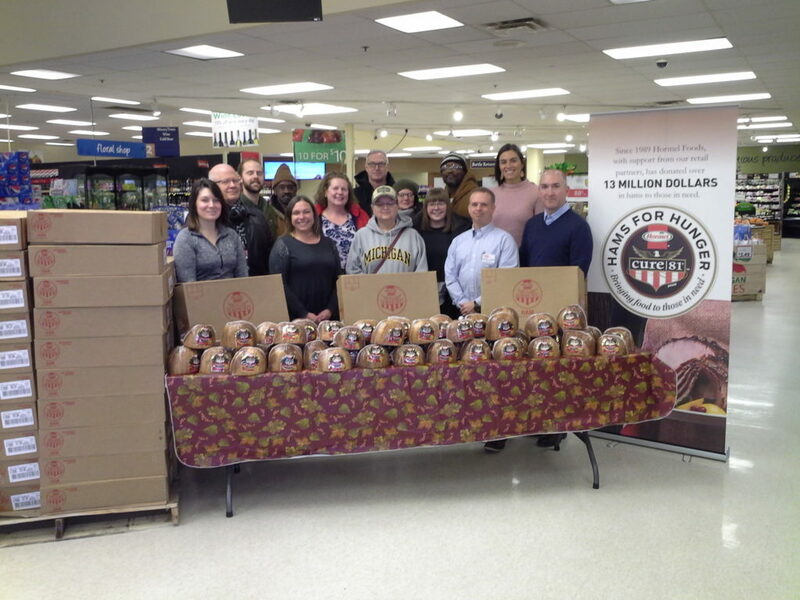 GRAND RAPIDS, Mich. – Hormel Foods Corporation and SpartanNash today donated 351 Hormel® Cure 81® half hams to North End Community Ministries, Northwest Food Pantry, Baxter Community Center and SECOM to help feed those in need. The makers of the Hormel Cure 81 brand created the Hormel Cure 81 Hams for Hunger program in 1986. The program involves a partnership between Hormel Foods and grocery retailers across the country. Throughout the years, more than $13 million dollars in hams has been donated, feeding tens of thousands of families. In 2016, SpartanNash donated 5.525 million pounds of product to community food pantries and local nonprofits throughout its company footprint. The SpartanNash Foundation also granted nearly $500,000 to organizations that provide hunger relief. Hormel Foods will donate more than 38,000 hams to charities nationwide through the Hormel® Cure 81® Hams for Hunger program. SpartanNash (Nasdaq: SPTN) is a Fortune 350 company whose core businesses include distributing grocery products to independent grocery retailers, select national accounts, its corporate-owned retail stores and U.S. military commissaries and exchanges. SpartanNash serves customer locations in 47 states and the District of Columbia, Europe, Cuba, Puerto Rico, Bahrain and Egypt. As of today, SpartanNash currently operates 144 supermarkets, primarily under the banners of Family Fare Supermarkets, VG’s Food and Pharmacy, D&W Fresh Market, Sun Mart and Family Fresh Market. Through its MDV military division, SpartanNash is a leading distributor of grocery products to U.S. military commissaries. Hormel Foods Corporation, based in Austin, Minn., is a global branded food company with over $9 billion in annual revenue across 75 countries worldwide. Its brands include SKIPPY®, SPAM®, Hormel® Natural Choice®, Applegate®, Justin’s®, Wholly Guacamole®, Hormel® Black Label® and more than 30 other beloved brands. The company is a member of the S&P 500 Index and the S&P 500 Dividend Aristocrats, was named one of “The 100 Best Corporate Citizens” by Corporate Responsibility Magazine for the ninth year in a row, and has received numerous other awards and accolades for its corporate responsibility and community service efforts. In 2016, the company celebrated its 125th anniversary and announced its new vision for the future – Inspired People. Inspired Food.™ – focusing on its legacy of innovation. For more information, visit www.hormelfoods.com and https://csr.hormelfoods.com/.